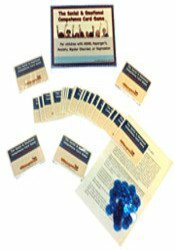 The Social and Emotional Competence Game Card Set (Revised) can be used with the Social and Emotional Competence Game or as a stand alone card game. The goal is to educate players about a specific disorder and provide skills for managing the disorder. There are five decks of cards, one for each disorder: Anxiety, Depression ADHD, Asperger’s, and Bipolar Disorder. Blank cards are included so that counselors/teachers can write their own questions or comments.